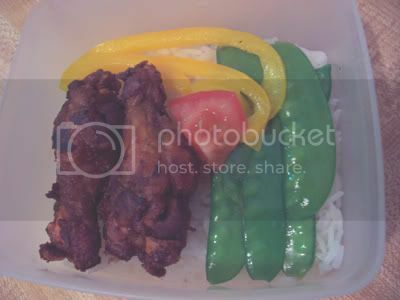 This month’s Lasang Pinoy theme, hosted by Ajay, is make your own Bento. My daughters and I pack our own lunches for school and work and have always aspired to make them more aesthetic like the Japanese bentos; but our attempts have always been half-hearted at best because mornings are usually so hectic that we usually end up dumping in a lunch container, whatever is left over from the last night’s dinner. Now with the bento theme, we really had the best of intentions and had even scouted our local asian markets for bento boxes without luck. Then before we could assemble our bentos, life interrupted and I had to go away for a while. In the meantime, I had missed the deadline for posting for Lasang Pinoy! My apologies to Ajay for this late post. This tiny bento was my daughter Jade’s lunch before I went away. We haven’t given up on our attempts at more aesthetic lunches, we’ll be posting future attempts here. Thanks to Ajay for hosting this month’s Lasang Pinoy. Pingback: Ajay’s Writings on the Wall… » The great (late!) Lasang Pinoy 25 round-up…. Hi sweetie, can’t wait for the bento boxes to arrive either. We’ll have fun making more pretty lunches. MMm that lunch was very good and very popular that next day, I was surprised my friends got that it was a bento lol!! I was verry proud. Can’t wait for our real bentos to arrive tuesday mama! I’m sorry to hear that you missed the deadline. i love how you laid out the chicken and the veggies. the color combination is balanced and i love how the little splash of red from the tomato pulls it all together. Maybe not compartmentalized, but still beautiful.